Heuchera ‘Berry Smoothie’ has quickly become one of our top selling plants this year! 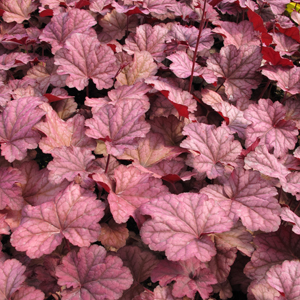 ‘Berry Smoothie’ is a tasty new Heuchera for 2010 that will add a bit of flavor to your garden or landscape. Its large 5-inch rose-pink leaves will not fade during the season. Pinkish-white flowers stand tall above the foliage during the summer months. The big, bold habit of ‘Berry Smoothie’ makes for great color year round. Supertunia Pretty Much Picasso has quickly soared to our top seller list this winter. This Petunia plant is new for 2010 is a must have flower that is sure to turn heads and strike up a conversation in your garden. When I first saw it last summer at a large plant convention I wasn’t sure what I thought. But after looking at it through out the day is quickly grew on me. The unique colors make this unlike any other petunia plant. Pretty Much Picasso is a petunia hybrid that is the first of its kind with bright pink blooms edged in a lime-green accent. One plant can grow up to 24 inches across and lasts weeks longer than other petunias! Mix Supertunia Pretty Much Picasso with Lobularia Snow Princess for a breath taking combination. Performs great in baskets, containers, and in the landscape. Fertilize often for best results. Last year our top selling annual was Diamond Frost® Euphorbia. People just loved the light airy look and feel that this plant gives. They were planting it with just about every thing including New Guinea Impatiens, Dahlias, & Petunias. 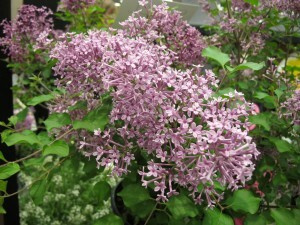 It is a great filler that blooms all summer long. (Euphorbia) Diamond Frost® Euphorbia is a must have for all gardeners. Diamond Frost®, a Proven Winners® top seller is drought and heat tolerant. The small flowers provide a airy mass of white color in full sun or part shade.